UNITED NATIONS, Jul 17 2013 (IPS) - The rise of the “global middle class” is widely attributed to the gradual eradication of extreme poverty in the developing world, even as the United Nations says that millions of people in countries such as India, China and Brazil have graduated from the ranks of the indigent. But is there unintended negative fallout indirectly linking poverty alleviation to the current rise in middle class street protests in Brazil, Turkey, Tunisia and Egypt, among others? Far from being original, it recycles some long-standing propaganda themes associated with conservative thinking.The first problem involves the concept of middle class. What is this class and how are we to identify it? Certainly not in terms of employment, urban/rural location, property ownership or any of the other usual signs of social stratification and class status, but rather a vague sociological catch-all, presumably located between those in absolute poverty on the one hand and those with wealth and privilege on the other. If we look at things this way, then what is the value of the concept except as a celebratory affirmation that most of global society is living in the middle class and thus (by implication) some degree of comfort. But can we really say this? The evidence suggests we cannot. Where are the vast impoverished peasantry and landless agricultural workers living in the global countryside in this model of comfort and where, too are the hundreds of millions of urban dwellers living in slums, under the most precarious conditions? The second problem involves the idea of a growing middle class and consequently a diminishment of global poverty. This is a highly-contested terrain, since the measure of poverty has been so highly distorted by the World Bank, the Millennium Development Goal (MDG) mafia at the UN, and other interested parties, keen to declare success in the war on poverty. With more than a billion people hungry and another billion lacking adequate nutrition for full health, it would appear that about a third of the world's population are in a dire condition of life. These numbers have risen substantially since 2007, suggesting that the global comfort zone is not expanding as the optimists would have us think. Furthermore spreading problems in the agricultural sector suggest that the numbers of those living in food-precarious conditions will likely grow, accelerated by drought, flooding and land-grabbing on a massive scale. Add to this the global economic problems and financial instability and we see that urban areas will not be a fount of well-being either and that the trends are moving in negative directions, including in those countries like China and India where the most gains were made in recent years. Finally, we come to the question of whether or not the supposed rising well-being is leading to the protests we see in Turkey, Brazil, Egypt and other lands. This is sometimes referred to as the revolution of rising expectations and it obviously is at odds with ideas of revolution resulting from increasing poverty and oppression. As for the present wave of protests, there is obviously not a single thread between the militant protests in Greece and those in Brazil, but it should not be forgotten that the Brazilian economic miracle has stalled and that the political class has been getting away with astounding corruption. India and China have also experienced economic slowdowns and political dysfunction. If a single thread is to be sought throughout all the global protests, with all their specificities, it might be this: the global political and economic order is in terrible disarray, the global economic system is in trouble, climate change is putting enormous new stresses on life, critical raw materials (especially petroleum) are in increasingly short supply, food production is falling short, and politics at every level is failing miserably to respond. The challenge is to enhance institutions so they can respond to a new high-level intensity, says Munoz, who is also UNDP’s director of Latin America. The UNDP estimates that more than 80 percent of the world’s middle class will be living in developing countries by 2030. According to the European Union Institute of Security Studies, the estimated size of the global middle class by 2030 will be about 4.9 billion, up from 1.8 billion in 2009. In an article in the Wall Street Journal last month, Francis Fukuyama, a senior fellow at Stanford University’s Freeman Spogli Institute of International Studies, says in Turkey and Brazil, as in Tunisia and Egypt before them, political protest has been led not by the poor but by young people with higher-than-average levels of education and income. And corporations are salivating at the prospect of this emerging middle class because it represents a vast pool of new consumers, he notes. Dean Baker, co-director of the Washington-based Center for Economic and Policy Research, told IPS, “I wouldn’t claim to be a great expert on this, but I would expect that as societies become richer and populations more educated, there will be increased demand for democracy. In any case, he said, an increased democratisation of society goes along with greater wealth. 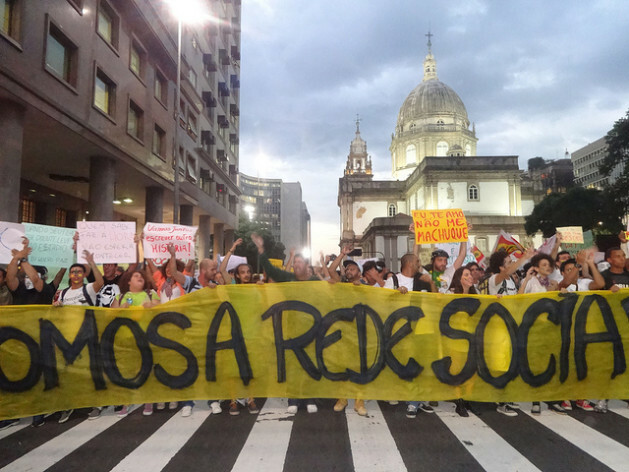 In Brazil, the recent protests were directed at the rising cost of living (including an increase in bus fares), high-level political corruption and extravagant spending on next year’s World Cup soccer tournament, estimated at more than 13 billion dollars compared to the deteriorating state of schools and hospitals in poor neighbourhoods. The protests have been described as “the awakening of the new middle class” emerging out of poverty. Richard Jolly, honorary professor and research associate at the Institute of Development Studies at the University of Sussex, told IPS, “It’s certainly an interesting theme though one to be written about with many question marks, rather than dogmatic certainties. “I hope you will also consider some reference to the recent rise of ‘assertive religion’ – meaning fundamentalist versions of Christianity and Judaism, as well as Islam, which Emanuel de Kadt has just published a book about, with the same name. “I think also of a book written decades ago which argued that revolution starts not when the poor are ground down in poverty but after some improvements in living standards which stirs hopes and demands for something more,” said Jolly, a former assistant secretary-general at the U.N. children’s agency UNICEF. Dr. Yilmaz Akyuz, chief economist at the Geneva-based South Centre, however, remains sceptical. “I find the rise of the global middle class story not very convincing,” he said. Akyuz said it is closely linked to the “rise of the South” story – “something I questioned in various papers I have written since 2010 (see e.g. The Staggering Rise of the South? or Waving or Drowning: Developing Countries After the Financial Crisis)”. It is now increasingly understood that this is a myth, said Akyuz, a former director and chief economist at the U.N. Conference on Trade and Development (UNCTAD). This, together with greater inequality would produce hollowing out since the top would be gaining at the expense of the middle class. Middle classes in the South are increasingly internationalised in vision and better informed through access to the internet, social media, etc. This is why Turkish Prime Minister Recep Tayyip Erdogan called social media a menace, he said. At the same time, governments in countries heavily dependent on foreign capital and vulnerable to financial instability are well aware that increased political instability could lead to capital flight and economic collapse, Akyuz said.